During a Reddit AMA about their latest RTS Forged Battalion, developers Petroglyph revealed they were keen to create a sequel to their breakthrough RTS title Star Wars: Empire at War, and had even approached EA about the idea. This is the site you’re looking for – check our list of the best Star Wars games on PC. During the AMA, one redditor asked Petroglyph whether an official expansion for Star Wars: Empire at War could be expected in the future. “Unfortunately, no official expansion is in the works – although we are still collecting data and hoping to get another patch out based on feedback,” a developer named Ted writes back. “This is something that is purely corporate. I don’t have details, but EA has the licence to do all Star Wars games and they seem focused on making a few titles at a very high quality bar. So, they are using all their available resources to that end, which means that if you’re not into FPS, it’s not currently a priority. 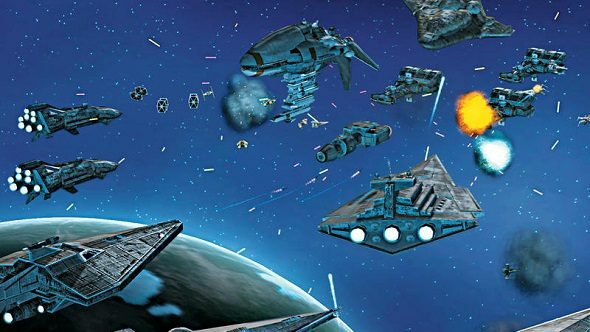 Originally released in 2006, Star Wars: Empire at War is an RTS set between Episode III and Episode IV of the franchise and focuses on the struggle between the Empire and the Rebels. Last year, the title received new patches and Steam Workshop support which breathed new life into the decade-old game and sparked hopes for a sequel. However, even though the development team seem eager, the decision appears to be out of their hands.